Payson Arizona is one of the fastest growing communities in all of Northern Arizona. With its elegant luxury home communities including Chaparral Pines and The Rim Club, Payson is quickly becoming the prime location for a second home or vacation getaway destination. Homes for sale in these two communities range in price from $500,000 to the multi-millions. Chaparral Pines - Only 90 minutes outside of the heat and congestion of Scottsdale and Phoenix Arizona, this spectacular community has everything you need to relax and enjoy the high country. Boosting one of the finest golf communities in all of Arizona, Chaparral Pines Golf Club offers members 18 holes of enjoyment, and misery. One of the most challenging courses in the Rim Country, this course is sure to challenge every shot in your bag. Priced from the low $500s to the multi-millions, each home features “forest” architecture, which helps blends into the community’s natural surroundings and colorful beauty. While the premium homes are located on the golf course, you are sure to find a perfect location just off the course. Search homes and real estate for sale in Chaparral Pines. 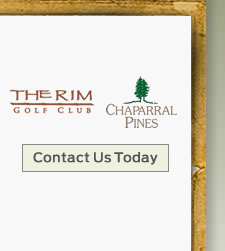 Rim Club - Neighboring Chaparral Pines, The Rim Club is consistently named as one of the top residential golf course communities West of the Carolina's. In comparison to Chaparral Pines, the lot sizes and home sizes are consistently larger and higher priced. Prime real estate in The Rim Golf Club is available. If you are searching for real estate and homes for sale in the Rim Club, our listings include agents, builders, land for sale, developments, and much more. The Rim Club is limited to 295 residents. Initiation fee to become an equity member is $100,000. Monthly dues are $775.